We are the first ones to provide 70-664 exam guide, 70-567 certification material, and mb6-819 dumps with 100% exam pass guarantee. You can also download our 70-292 ebook dumps and HP0-Y36 book study guide to get success within days. Five lines of ancient script on a shard of pottery could be the oldest example of Hebrew writing ever discovered, an archaeologist in Israel says. November 1, 2008 -- The shard [right] was found by a teenage volunteer during a dig about 20km (12 miles) south-west of Jerusalem. It contains symbols believed to be that of an ancient alphabet called proto-Canaanite or First Tongue. Experts at Hebrew University said dating showed it was written 3,000 years ago - about 1,000 years earlier than the Dead Sea Scrolls. This era roughly corresponds to the time of the First Temple, ruled by the biblical figures of David and Solomon and may predate the time this same alphabet was being used by the Queen of Sheba (allegedly wed to Solomon) in what is now Yemen. Scripts in Yemen appear to be written in this same alphabet and translations, using ancient Hebrew, describe the burial of the Ark of Moses at a site near Mareb -- in the ancient kingdom of Saba. Scientists caution that further study is needed to understand this. Above: proto-Canaanite alphabet used by Gary Vey and John McGovern in their global research with this ancient language (aka: "First Tongue" and "Old Negev"). The use of this language in early Hebrew history would explain why the same language was used in the ancient kingdom of Saba (Sheba). In legend and in the Holy Quaran, it is suggested that the Queen Sheba was invited to visit King Solomon, at which time they wed and had a son, Menelik. Further research by Gary Vey and John McGovern has shown that the recently uncovered palace of the Queen, in Mareb, Yemen, bares inscriptions in the same alphabet that describe the relocation of the famed Ark of the Covenant to the site by Solomon's son following the destruction of Jerusalem. Both Vey and McGovern believe it remains there today. The elaborate dam-wall was constructed to hide and protect a chamber where the Ark was buried, along with Solomon and Sheba's son, Menelik, until such time as "friendly nations" were overhead. The archaeological site is located in Mareb, Yemen, in what is known as the "empty quarter." This is a very dry and desolate environment with sand dunes and kilometers of empty space. As the wind moved the dunes, Bedouins would get momentary glimpses of buried foudations and walls, only to have them covered again by time and more sand. Rumors of a large wall led archaeologists to uncover a huge complex which has become the most secret site in the mid-East. A large stone wall some 60 feet high and 15 feet thick forms an oval that protects a large courtyard which has yet to be excavated. On the wall there was a stream of symbols that could not be translated. In 2001 a team from the University of Calgary briefly took control of the site and cleared the entire wall of sand, revealing the full script. Photographs of the wall made its way to America where Gary Vey, editor of viewzone.com, had been working with the same alphabet for a few years and had successfully translated other examples of the script, found oddly enough in Colorado and the Israeli Negev desert, by using an old Hebrew dialect. The site has been a dangerous extremist outpost since September 2001 and no further work has been done there. 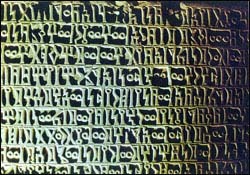 Academics were critical of Vey's work because a similar alphabet had been used in Ethiopia around 500 AD and translated using a form of Arabic. 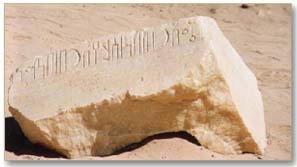 They doubted that Hebrew could be used; however, in 2001 Vey successfully translated portions of the wall's script from photographs (see above). The results revealed a prose describing the "box of El" and spoke about a "son" and "father." Vey later learned this was a reference to the Ark, Solomon and Sheba's son, Menelik, and to the "father" - Solomon himself. the location of the Father's great box of EL. and to be associated with the Lord's spirit. The Son constructed a chamber for the beautiful Lord's spirit and covered it up. He accompanied the chamber of the Lord underneath to pray and to gain understanding and to protect..."
Other photos also helped build the case for the Ark being stored in Yemen. While traditional archaeologists still attempt to interpret the Yemeni alphabet as an early form of Arabic, this new discovery of an ancient artifact from the same period as the Mareb, Yemen site proves that the alphabet originated as an early writing system for proto-Canaanite, a precursor to Hebrew. Preliminary investigations since the shard was found in July have deciphered some words, including judge, slave and king, but Vey and McGovern have not been provided clear photographs or copies of the text to translate using their methodology. According to news reports, the actual text has been classified as "secret" by Israeli archaeologists. But they do admit the characters are written in proto-Canaanite, a precursor of the Hebrew alphabet. Ironically, Vey has created a translation program (HERE) which is open to the public. Says Vey, "History belongs to humanity. Nothing about the past should be secret." [Above] This carved stone in the Yemen museum was displayed upside-down. 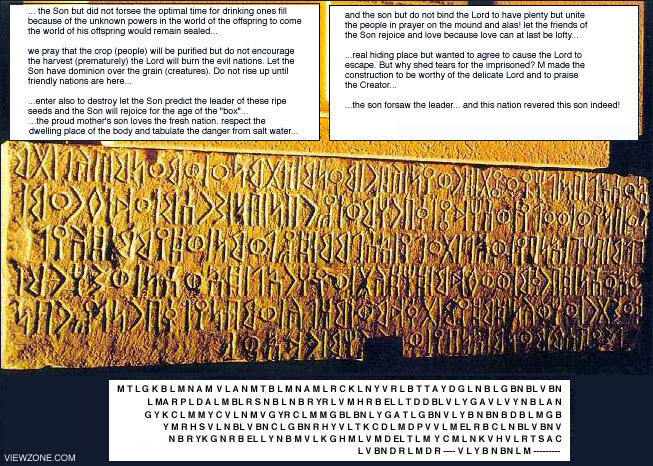 It has been rotated in this image using Photoshop and translated using the ancient form of Hebrew. The translation seems to be part of a larger text describing the burial of Menelik with the Ark and the future conditions that must transpire before the chamber containing both the Ark and Menelik will be opened. Other portions of this prophetic wall have been found where they were removed and used as the foundation of other buildings. Many texts refer to the "mother" -- the Queen of Sheba herself (whose name is never used) -- and describe her dilema when she was instructed by her son to be buried under the sand for an indefinite length of time to avoid the enemies who had sacked the Temple in Israel (and were headed for Mareb) and future evil nations until such time as the world was ready for peace and love. Texts describe how she initially had the buried chamber constructed in such a way that it could be disassembled quickly to save her son (no mortar). Curiously, the texts describe the installation of a secret "aperature" where she could spy on her son to monitor his safety. It also describes how the chamber remained silent for a long time, how a worm crawled out of it and how she had to decide whether or not to open it prematurely to save her son -- or to have faith in his prophecy that the Ark would preserve him, no matter how long he remanied buried. 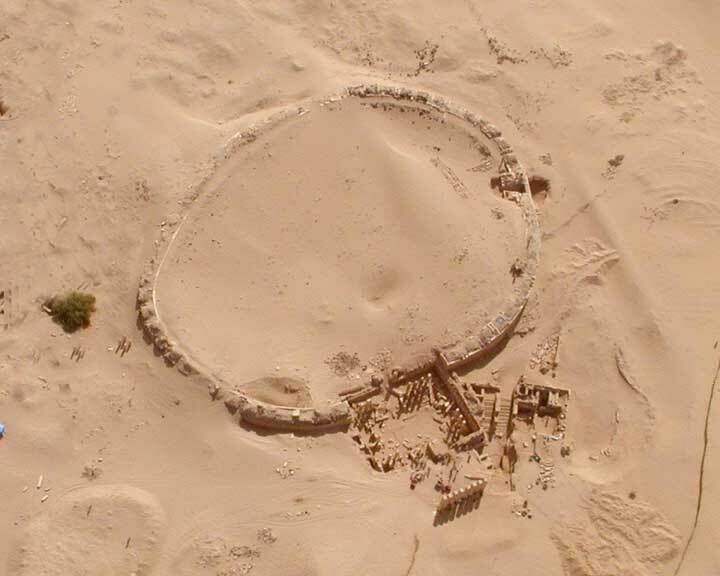 In the end the queen opted to have faith and constructed a better, more fortified chamber around the old one, constructed the large wall as a barrier against the possible rupture of the great Mareb Dam (which did actually break and flood the land several times), and then covered and hid the entire structure in sand. She then moved her kingdom to Ethiopia and changed the phonetic values of the language (to Himyaridic) so that the son and the Ark would remain unmolested -- even if ancient artifacts were uncovered. A copy of the Ark (the "box of El") was also constructed as a "red herring" and remains today in Ethiopia. Lead archaeologist Yosef Garfinkel identified it as Hebrew because of a three-letter verb meaning "to do" which he said was only used in Hebrew. "That leads us to believe that this is Hebrew, and that this is the oldest Hebrew inscription that has been found," he said. The shard and other artefacts were found at the site of Khirbet Qeiyafa, overlooking the Valley of Elah where the Bible says the Israelite David fought the Philistine giant Goliath. Mr Garfinkel said the findings could shed significant light on the period of King David's reign. "The chronology and geography of Khirbet Qeiyafa create a unique meeting point between the mythology, history, historiography and archaeology of King David... The differentiation between the scripts, and between the languages themselves in that period, remains unclear." 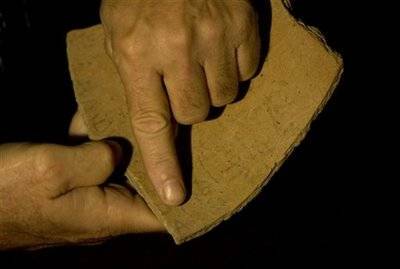 But his colleagues at Hebrew University said the Israelites were not the only ones using proto-Canaanite characters, therefore making it difficult to prove it was Hebrew and not a related tongue spoken in the area at the time. Hebrew University archaeologist Amihai Mazar said the inscription was "very important", as it is the longest proto-Canaanite text ever found. Both Gary Vey and John McGovern, who have spent years locating and translating proto-Canaanite texts (which they call "First Tongue") disagree, citing lengthy scripts on the so-called "Sheba Palace" in Yemen and much older texts elsewhere in the world. Their findings with this ancient script can be found at viewzone.com.expo2002.html.